Dr. Celine Gisbert received her medical degree from the University of Santo Tomas in Manila, Philippines. She completed her residency training at Conemaugh Memorial Medical Center in Johnstown, PA and also completed an Advanced Curriculum Fellowship Program from the American Society of Bariatric Physicians. ... Read More She is board certified in both Family Medicine and Obesity Medicine (ABOM). Dr. Gisbert has medical interests in wellness, nutrition and preventative medicine as well as pediatric and adult obesity. She worked as a Medical Bariatrician and had cared for Bariatric Surgery patients before and after their surgery. She also has 8 years of experience in Urgent Care/Occupational Medicine and is a Medical Review Officer and DOT certified examiner. 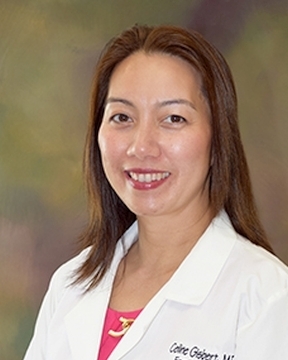 Dr. Gisbert enjoys spending all of her free time with her family. She loves to travel to different countries with them and simply enjoy life. Her hobbies include swimming, jewelry making and cake decorating.